When you export the results of an audit log search from the Security & Compliance Center, you have the option to download all the results that meet your search criteria. You do this by selecting Export results > Download all results on the Audit log search page. For more information, see Search the audit log in the Office 365. When your export all results for an audit log search, the raw data from the Office 365 unified audit log is copied to a comma separated value (CSV) file this is downloaded to your local computer. This file contains additional information from the audit log entry in a column named Detail. This column contains a multi-value property for multiple properties from the audit log record. Each of the property:value pairs in this multi-value property are separated by a comma. The following table describes the properties that are included—depending on the Office 365 service in which an event occurs—in the multi-property Detail column. The Office 365 service that has this property column indicates the service and type of activity (user or admin) that includes the property. For more detailed information about these properties or about properties that might not be listed in this topic, see Office 365 Management Activity API Schema. You can use the Power Query in Excel to split this column into multiple columns so that each property will have its own column. This will let you sort and filter on one or more of these properties. To learn how to do this, see the "Split a column by delimiter" section in Split a column of text (Power Query). AddOnType The type of an add-on that was added, removed, or updated in a team. The following values indicate the type of add-on. 1 - Indicates a bot. 2 - Indicates a connector. AzureActiveDirectoryEventType The type of Azure Active Directory event. The following values indicate the type of event. 0 - Indicates an account login event. 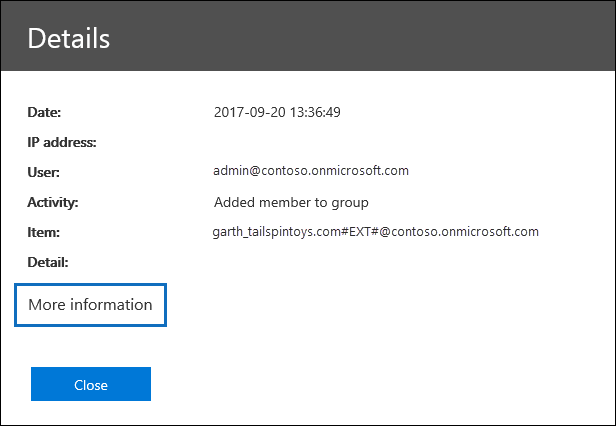 ExternalAccess For Exchange admin activity, specifies whether the cmdlet was run by a user in your organization, by Microsoft datacenter personnel or a datacenter service account, or by a delegated administrator. The value False indicates that the cmdlet was run by someone in your organization. The value True indicates that the cmdlet was run by datacenter personnel, a datacenter service account, or a delegated administrator. LogonType The type of mailbox access. The following values indicate the type of user who accessed the mailbox. 0 - Indicates a mailbox owner. 1 - Indicates an administrator. 2 - Indicates a delegate. 3 - Indicates the transport service in the Microsoft datacenter. 4 - Indicates a service account in the Microsoft datacenter. Members Lists the users that have been added or removed from a team. The following values indicate the Role type assigned to the user. ObjectID For Exchange admin audit logging, the name of the object that was modified by the cmdlet. For SharePoint activity, the full URL path name of the file or folder accessed by a user. Operation The name of the user or admin activity. The value of this property corresponds to the value that was selected in the Activities drop down list. If Show results for all activities was selected, the report will included entries for all user and admin activities for all services. For a description of the operations/activities that are logged in the Office 365 audit log, see the Audited activities tab in Search the audit log in the Office 365. RecordType The type of operation indicated by the record. The following values indicate the record type. 1 - Indicates a record from the Exchange admin audit log. 2 - Indicates a record from the Exchange mailbox audit log for an operation performed on a singled mailbox item. 3 - Also indicates a record from the Exchange mailbox audit log. This record type indicates the operation was performed on multiple items in the source mailbox (such as moving multiple items to the Deleted Items folder or permanently deleting multiple items). 4 - Indicates a site admin operation in SharePoint, such as an administrator or user assigning permissions to a site. 6 - Indicates a file or folder-related operation in SharePoint, such as a user viewing or modifying a file. 8 - Indicates an admin operation performed in Azure Active Directory. 9 - Indicates OrgId logon events in Azure Active Directory. This record type is being deprecated. 10 - Indicates security cmdlet events that were performed by Microsoft personnel in the data center. 11 - Indicates Data loss protection (DLP) events in SharePoint. 12 - Indicates Sway events. 13 - Indicates DLP events in Exchange, when configured with a unified a DLP policy. DLP events based on Exchange mail flow rules (also known as transport rules) aren't supported. 14 - Indicates sharing events in SharePoint. 15 - Indicates Secure Token Service (STS) logon events in Azure Active Directory. 18 - Indicates Security & Compliance Center events. 20 - Indicates Power BI events. 21- Indicates Dynamics 365 events. 22 - Indicates Yammer events. 23 - Indicates Skype for Business events. 24 - Indicates eDiscovery events. This record type indicates activities that were performed by running content searches and managing eDiscovery cases in the security and compliance center. For more information, see Search for eDiscovery activities in the Office 365 audit log. 25, 26, or 27 - Indicates Microsoft Teams events. 28 - Indicates phishing and malware events from Exchange Online Protection and Office 365 Advanced Threat Protection events. 30 - Indicates Microsoft Flow events. 32 - Indicated Microsoft Stream events. 35 - Indicates Microsoft Project events. 36 - Indicates SharePoint list events. 38 - Indicates events related to retention policies and retention labels in the security and compliance center. 40 - Indicates events that results from security and compliance alert signals. 41 - Indicates safe links time-of-block and block override events in Office 365 Advanced Threat Protection. 44 - Indicates Workplace Analytics events. 45 - Indicates PowerApps app events. ResultStatus Indicates whether the action (specified in the Operation property) was successful or not. Excelpin - An Excel tab. Extension - All first-party and third-party apps; such as Planner, VSTS, and Forms. Pdfpin - A PDF tab. Powerbi - A PowerBI tab. Powerpointpin - A PowerPoint tab. Sharepointfiles - A SharePoint tab. Webpage - A pinned website tab. Wiki-tab - A wiki tab. UserType The type of user that performed the operation. The following values indicate the user type. 0 - A regular user. 2 - An administrator in your Office 365 organization. 3 - A Microsoft datacenter administrator or datacenter system account. 4 - A system account. 6 - A service principal. 7 - A custom policy. Note that the properties described above are also displayed when you click More information when viewing the details of a specific event.